398 Beacon is located on the north side of Beacon, between Fairfield and Gloucester, with 396 Beacon to the east and 400 Beacon to the west. 398 Beacon was built ca. 1872 by Bourn & Leavitt, a partnership of carpenters Robert Tower Bourn (Bourne) and William Leavitt, one of seven houses (388-390-392-394-396-398-400 Beacon) built for George H. Peters and his partners in the firm of Edward D. Peters & Co., commission merchants, for speculative sale. Click here for an index to the deeds for 398 Beacon. On March 23, 1878, the estate of Robert C. Hooper foreclosed on its mortgage to George Peters and sold 398 Beacon to Anna Cora (Marsh) Hawes, the wife of Joseph Prince Hawes, Jr. They had married in October of 1877. Prior to their marriage, he had lived at 17 Hereford with his parents, Joseph and Ellen (Hall) Hawes. Joseph Hawes was a wholesale dealer in spices, dyestuffs, and fertilizers. In April of 1878, Anna Hawes applied for (and subsequently received) permission to build a stable at the rear of the property. Joseph and Anna Hawes also maintained a home at 182 Savin Hill Avenue and it appears that, after the 1882-1883 winter season, they made that their principal residence and leased 398 Beacon to others during the winter seasons (they continued to list 398 Beacon as their home, along with their Savin Hill Avenue residence, in the City Directories, but other residents were listed at 398 Beacon in the 1884-1888 Blue Books). During the 1883-1884 winter season, 398 Beacon was the home of Thomas Reed Wheelock and his wife, Edith Haswell (Clarke) Wheelock. He was a ship broker doing business in Shanghai, China. 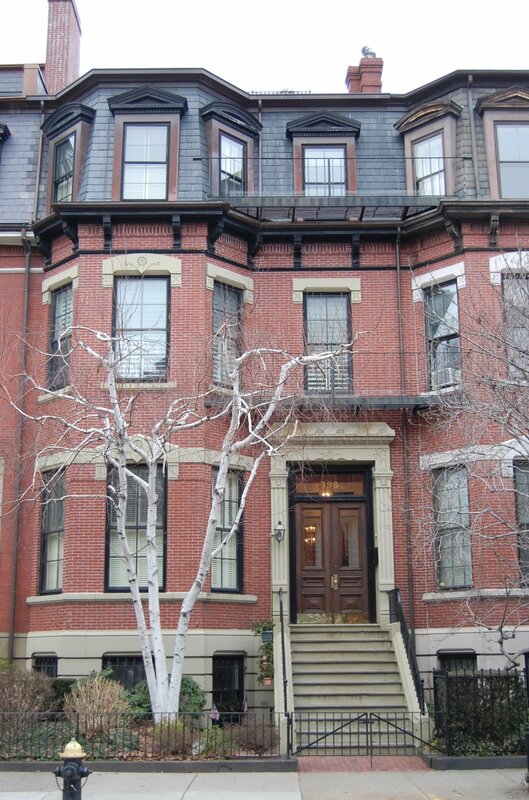 During the 1884-1885 winter season, 398 Beacon was the home of Ogden Codman and his wife, Sarah (Bradlee) Codman. Their son, Ogden Codman, Jr., lived with them. He was attending MIT and later would become a renowned architect and interior designer. The Codmans’ primary residence was The Grange in Lincoln. During the 1885-1886 winter season, 398 Beacon was the home of Elijah Brigham Phillips, president of the Fitchburg Railroad, and his wife, Maria Rebecca (Ayling) Phillips. Their son-in-law and daughter, Cyrus A. Page and Anna M. (Phillips) Page, lived with them. They had married in February of 1885. The Phillipses previously had lived at 353 Marlborough. They and the Pages continued to live at 398 Beacon during the 1886-1887 season, but moved thereafter to 339 Beacon. 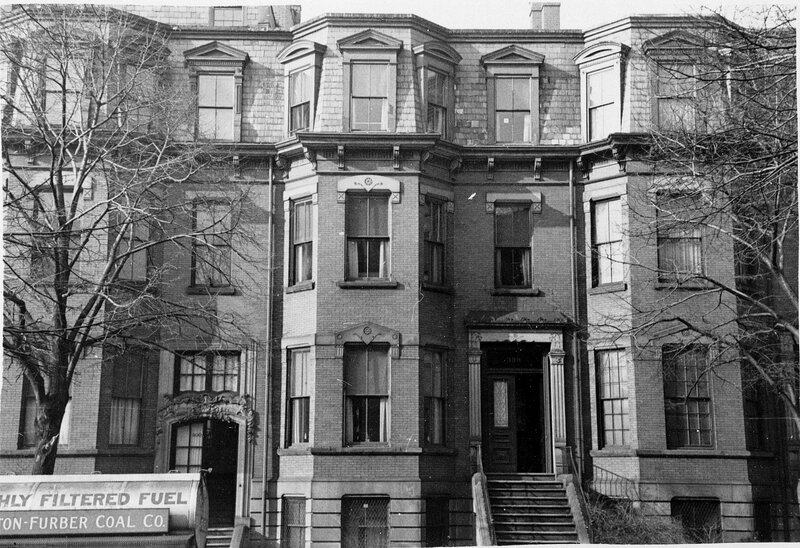 During the 1887-1888 winter season, 398 Beacon was the home of Francis Edward Bacon, a broker and commission merchant, and his wife, Louisa (Crowninshield) Bacon, whose daughters – Susan Gorham Bacon and Alice Putnam Bacon – were debutantes that season. They also maintained a home in Mattapoisett and had maintained a Boston home at 276 Beacon until about 1885. By the 1888-1889 winter season, they were living at 441 Beacon. 398 Beacon was not listed in the 1889 Blue Book. On February 20, 1889, 398 Beacon was purchased from Anna Hawes by Theophilus Parsons and Elizabeth Parsons, trustees under the will of their father, Thomas Parsons. It became their home and the home of their sisters, Charlotte Parsons and Lucy Parsons. Theophilus Parsons was treasurer of the Lyman Mills cotton manufacturing company in Holyoke. He married in August of 1894 to Mary Mason Oliver, and they moved to 251 Beacon. 398 Beacon remained the home of his sisters. 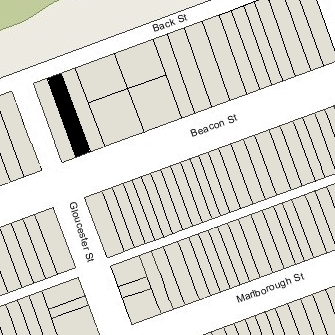 Elizabeth Parsons continued to live there during the 1910-1911 winter season, but moved soon thereafter to live with Theophilus Parsons (by that time a widower) at 223 Beacon, where she died in May of 1912. Charlotte and Lucy Parsons continued to live at 398 Beacon. They also maintained a home in Mattapoisett. Charlotte Parsons died in November of 1929, and Lucy Parsons died in May of 1935. On March 31, 1934, the trustees under Thomas Parsons’s will transferred a one-sixth interest in 398 Beacon to Theophilus Parsons’s only child, Susan Lawrence (Parsons) Plummer, the former wife of Morgan Hussey Plummer. She lived in Beverly Farms. The Plummers had divorced in the early 1930s; in the mid-1920s, they had lived at 223 Beacon. She married again in 1935 to Joseph Stanley, and on August 26, 1935, the trustees transferred an additional one-third interest to her. By the 1935-1936 winter season, Joseph and Susan Stanley had made 398 Beacon their home. Joseph and Susan Stanley divorced in the late 1930s. She continued to live at 398 Beacon until about 1944, but had moved to 101 Chestnut by 1945. On July 20, 1944, real estate dealer Henry C. Brookings acquired Susan (Parsons) Plummer Stanley’s interest in 398 Beacon, and on August 1, he acquired the remaining interest held by the estates of Theophilus, Lucy, and Charlotte Parsons. On August 3, 1945, 398 Beacon was acquired from Henry C. Brookings by Samuel R. Levey and his wife, Martha (Hellvitch) Levey. He was president and treasurer of the Majestic Liquor and Wine Company. They had lived in an apartment at 122 Marlborough in 1944. In about July of 1945, the Leveys purchased a home, Blynman, in the Magnolia district of Manchester, where they moved. On December 1, 1945, 398 Beacon was purchased from the Leveys by Ann Clare (Boothe) Brokaw Luce, the purchase being made under the name Ann C. Boothe. At the time she purchased the house, Clare Boothe Luce was a Member of Congress representing Stamford, Connecticut, where she lived with her husband, Henry Robinson Luce, publisher of Time, Life, and Fortune magazines. Clare Boothe Luce was a noted novelist, journalist, and playwright (her best known work being The Women). She was elected to Congress in 1942 and re-elected for a second in 1944. Under the Eisenhower administration, she served as Ambassador to Italy from 1953 to 1956, and briefly as Ambassador to Brazil in 1959. By 1947, 398 Beacon was the home of Mary E. McNeece and her sister, Anne McNeece, who operated it as a lodging house. They previously had lived at 9 West Hill Place. Mary McNeece was a milliner. They continued to live at 398 Beacon until 1948, when they moved to 232 Commonwealth. On April 30, 1948, 398 Beacon was purchased from Clare Boothe Luce by Mary Elizabeth (Arthur) Ricker, the wife of George Alvin Ricker. He was sales manager of the Poland Laundry Machine Company and later a broker. They previously had lived in Hingham and before that in Poland Springs, Maine, where he a vice president of his family’s Poland Springs House hotel. They continued to live at 398 Beacon until about 1960. On May 27, 1960, 398 Beacon was acquired from Mary Ricker by Ford H. Cooper, an architect, and on December 1, 1960, it was acquired from him by steel company executive Peter Charles Welch and his wife, Georgia Henriette (O’Neil) Welch. They previously had lived at 12 Branch. They continued to live at 398 Beacon until about 1963, when they moved to Weston. On May 29, 1963, 398 Beacon was purchased from Peter Welch by Allan Glazin and Francine E. Delescluse, trustees of the Delzin Realty Trust. Francine Delescluse was a dentist and in July of 1963, she applied for (and subsequently received) permission to convert the property into five apartments and a dentist’s office (noting that the dentist would also reside in the building). The application indicated that the property previously had been three apartments, although it appears to have been occupied as a single family dwelling. She lived and maintained her dental offices at 398 Beacon. She previously had lived in Cambridge. In February of 1964, she applied for (and subsequently received) permission to convert the property into five apartments and two doctor’s offices. In 1965, Francine Delescluse married to Pendennis White Reed, an attorney and manufacturing executive. After their marriage, they lived at 398 Beacon until about 1967, when they moved to 298 Chestnut. On March 31, 1967, 398 Beacon was purchased from Allan Glazin and Francine Reed by Richard L. Wing and his wife, Frances T. Wing of Malden. On January 2, 1970, they transferred the property into his name as trustee of the Lee Realty Trust. On May 2, 1972, 398 Beacon was purchased from Richard Wing by Edward G. Fallon. In March of 1974, he was cited by the Building Department for failing to secure a permit for change of occupancy from five apartments and two doctors’ offices to six apartments and an art gallery (which had been established in the basement without the owner’s knowledge). In April of 1974, he applied for (and subsequently received) permission to convert the property into six apartments. 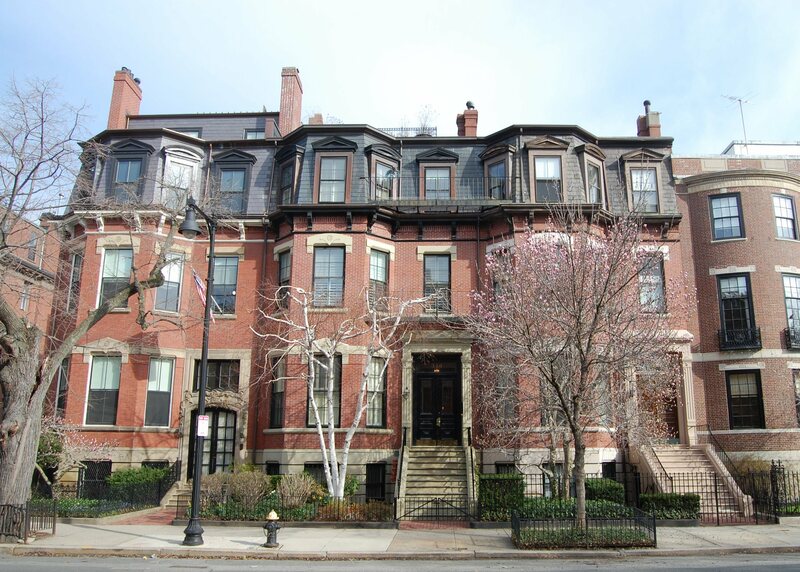 In February of 1978, Edward Fallon applied for (and subsequently received) permission to convert the property into five apartments, and on February 3, 1978, he converted the properly into five condominium units, The Condominium 398 Beacon Street. On March 16, 1985, the unit owners amended the master deed to reduce the number of units from five to four, reflecting the consolidation of units 4 and 5, and on February 16, 2006, they further amended the master deed to reduce the number of units from four to three, reflecting the consolidation of units 1 and 2.